“You’re going to love this,” she says as the elevator doors open on the fourth and uppermost floor of the Cape Grace Hotel in Cape Town, South Africa “She” is Jana, the hotel’s Public Relations Executive and she’s right: instead of a nondescript lobby, the elevator doors whoosh open to reveal the dream room in my fantasy house. 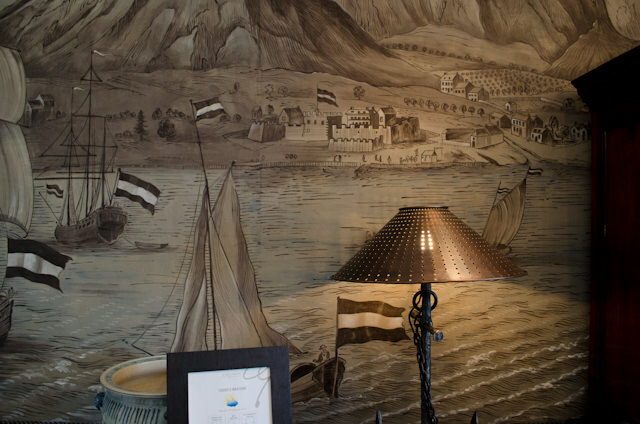 I actually let out an audible “gasp.” A magnificent hand-painted mural of Cape Town’s historic harbour lined the room, at the center of which stood a chest notable for being the only thing saved from an 1895 fire that destroyed the Groote Schuur, an estate owned by the Dutch East Indian Company. 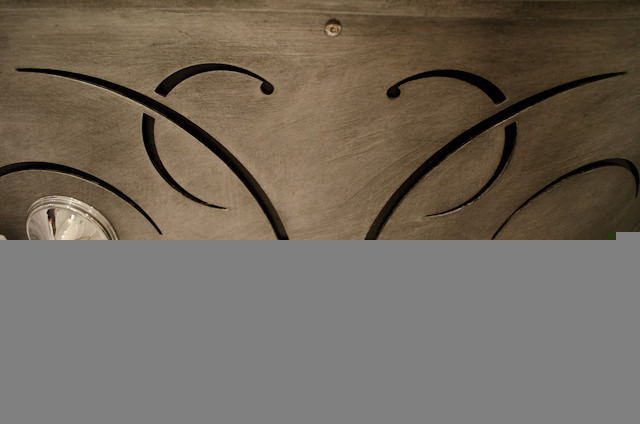 The chest itself dates back to 1795, and was a gift from Cecil Rhodes to Herbert John Baker. It is, without a doubt, priceless. On one side, a custom-designed lamp resembling an anchor cast light across a hand-crafted table. 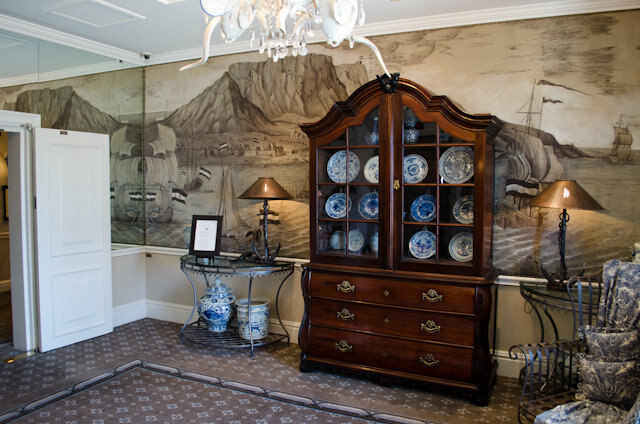 Artifacts from Cape Town’s maritime heritage graced the room, done in shades of soft white and nautical blue. “It’s like a beautiful woman,” Jana said. She’s right, of course – I couldn’t take my eyes off the room. And much like a beautiful woman, I am willing to bet the room looks spectacular in the soft evening light. Two things popped into my mind: I was immediately regretting my decision not to spend more time post-cruise in Cape Town. 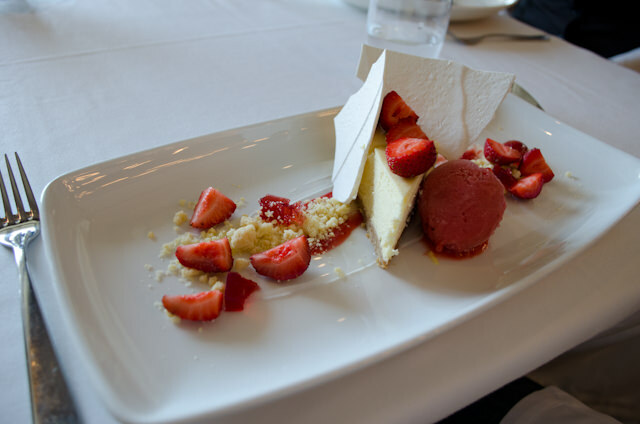 Secondly, I blinked hard to make sure I wasn’t still onboard Silversea’s elegant Silver Wind. 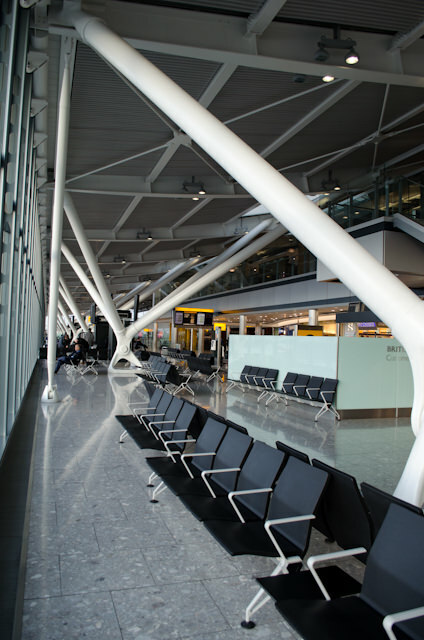 As usual, disembarkation was a snap: with a 10:20pm flight to London’s Heathrow airport, I was in no hurry to disembark, so I waited until my luggage colour tag (Brown) was called around 9:20 AM. I then walked off the ship, swiping my keycard through for the last time and saying goodbye to new and old friends from the crew and passenger complement alike. One particular person to mention is Guest Relations Manager Tim Trumpfheller, whom I met onboard Silver Spirit and who was just as congenial now as ever. With so much time to kill, I wanted to do something unique. 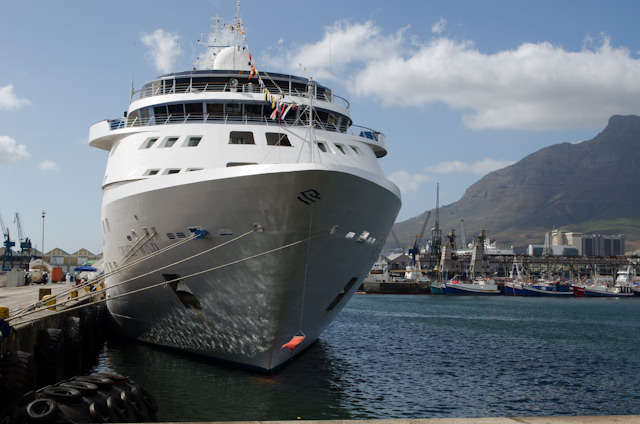 In particular, I wanted to see what one of Silversea’s partner hotels was like, so off I strolled along the Victoria & Alfred Waterfront over to the Cape Grace Hotel – an easy 10-minute stroll, with luggage, from the Silver Wind’s docking place at Jetty #2. When I arrived – as something of a fraud, a guest neither checking in nor staying – I was greeted warmly by the porters, who offered to carry my luggage up four steps so I didn’t have to struggle. Now, I know what you’re thinking: they were doing it for a tip. But they weren’t: they were genuinely interested in helping me. I arrived over an hour ahead of schedule. 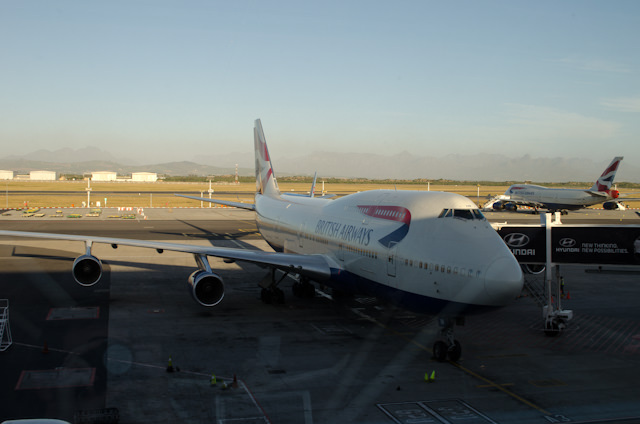 I figured if I was lucky, I’d be able to maybe store my bags; I was already working on my standard spiel when I was ushered over to a small desk (there is no imposing check-in counter at the Cape Grace) and welcomed warmly to the hotel. When I mentioned I was only there for a meeting, their tone didn’t change in the least. Can we store your luggage for you? Yes, of course – thank you. Would you like to go to the Library for a cup of tea? Yes. 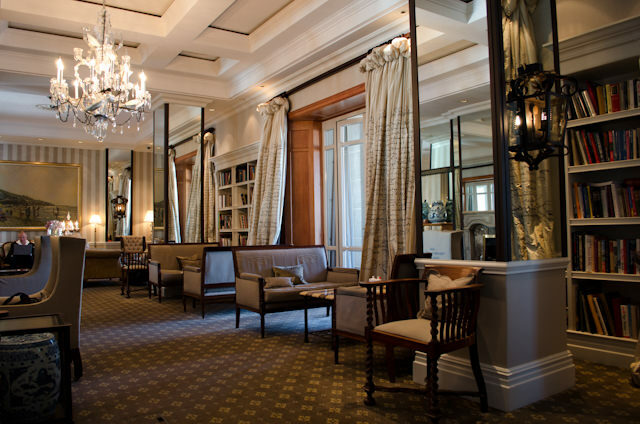 Oh, did I not mention there is a library at the Cape Grace? There is – and it is the most stunning one I have ever seen in a hotel. Come to think of it, it is the only library I have ever seen in a hotel. 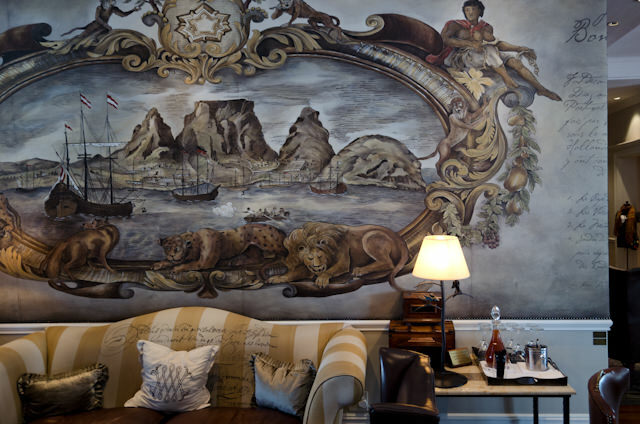 Adorned with nautical memorabilia and hand-painted curtains, everything in the room is evocative of South Africa’s rich history as a maritime trading outpost. Custom-made wrought-iron light sconces and fixtures adorn the room, and I settled into a plush, oversize chair with rattan back and sides. 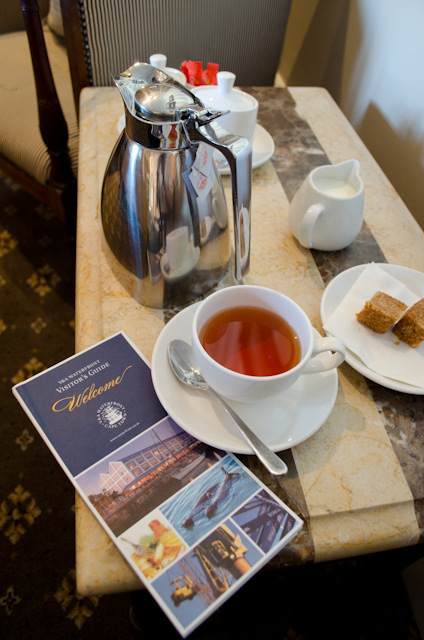 Tea came around promptly, but what I loved was that the service was genuine – not pretentious or stuffy like some luxury properties. I was dressed in jeans and a nice button-up shirt, while two men in t-shirts and shorts sat on my left, and a group of eight businessmen in full suits and ties sat directly ahead of me. And yet, I felt very comfortable. 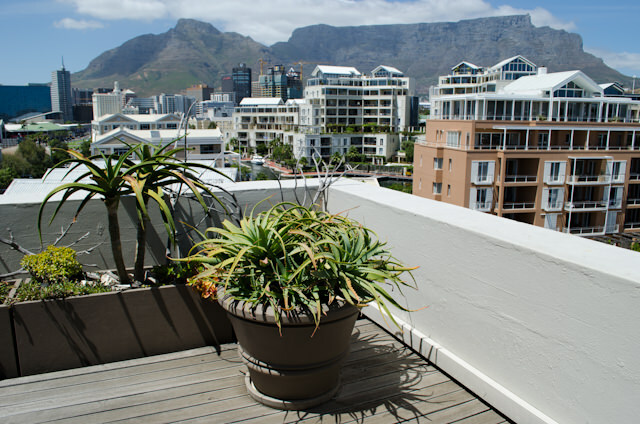 There are basically four categories of rooms at the Cape Grace, ranging in size from 484 square feet to the massive, three bedroom suite measuring 2,150 square feet. 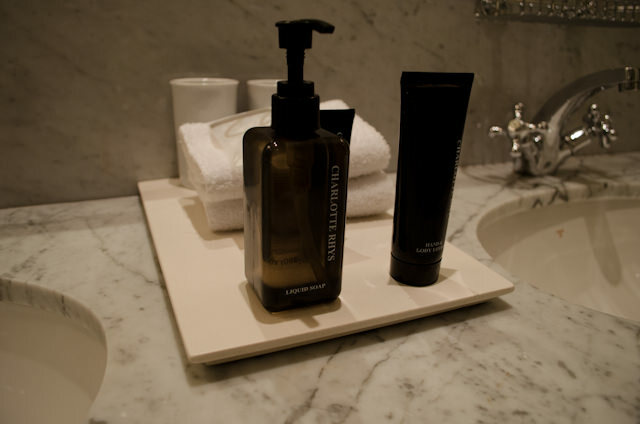 Each has a standard set of amenities that includes toiletries made in South Africa, coffee and tea from South Africa, and even bottled still and sparkling water that is made on-site. But that’s where the similarities end. 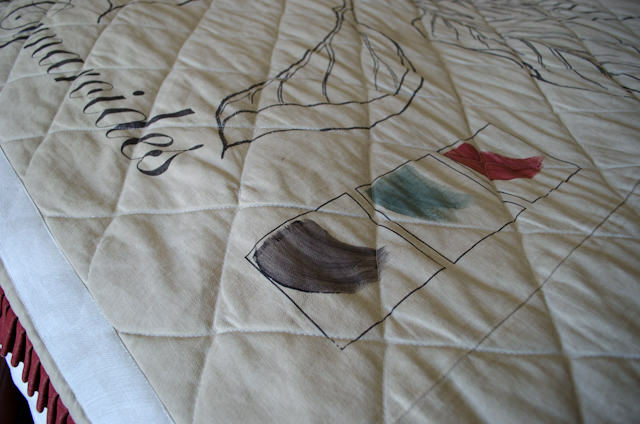 No two bedspreads, which are hand-painted by local artists, are alike. Ditto for the gorgeous, hand-painted curtains: each is completely unique. Even the furniture changes from room to room, floor to floor. Each floor has its own colour scheme running throughout the lobbies, corridors and guest rooms, and the property will even monogram custom sheets for repeat guests booking “their” favorite room. Even the curtains in the library, which feature handwritten text – aren’t arbitrary: the curtains contain real historic Cape Town journal entries that can be read if the curtains are drawn. 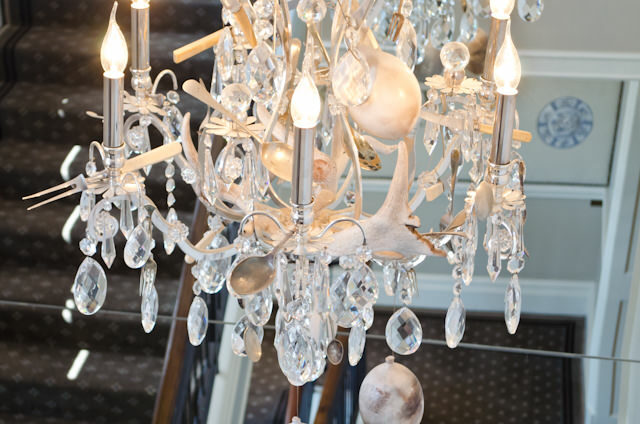 Knowing I was a lover of all things maritime, Jana had me look at the magnificent crystal chandeliers that adorn the central staircase: they depict a chandelier rising up from a shipwreck, carrying with it things like wine glasses, cups, anchors, and other nautical memorabilia. 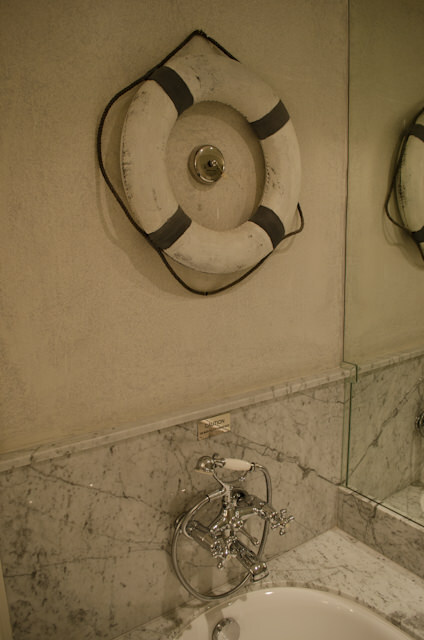 The nautical theme even continues in guest rooms, some of which feature classic white roped life rings as décor above the bath tub. 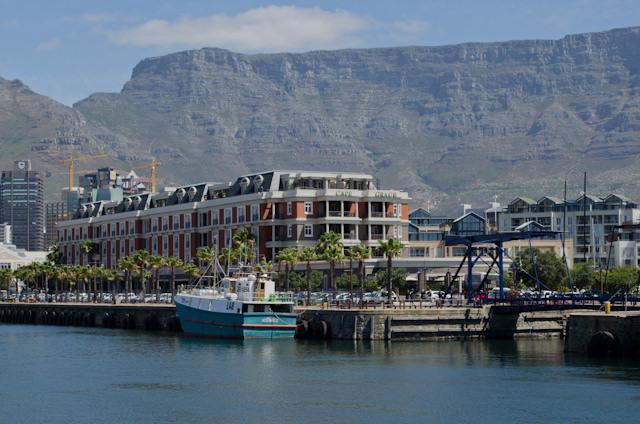 The Cape Grace has the largest whisky bar in the entire continent, and a wine cellar that would make even the staunchest teetotaler thirsty. 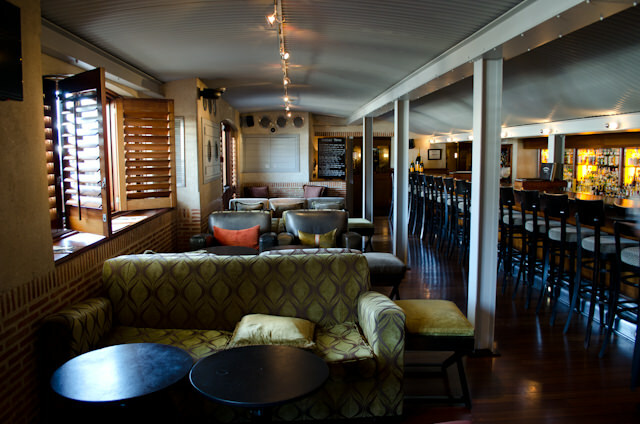 Patrons can even purchase memberships in the hotel’s unique Wine and Whisky clubs that allow them to store their favorite beverages on-site. I’ve been to some very nice hotels around the world, but I have never seen the same kind of loving thought and care placed into a hotel. 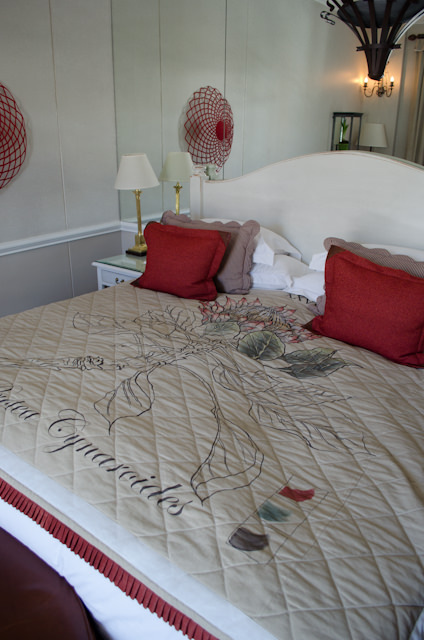 The Cape Grace is like a living, breathing museum, where every object has a story and every painting has a meaning. It’s elegant, yet welcoming: the hotel even rolls out the welcome mat for children, providing them with kid-sized robes and slippers and thoughtful touches like yellow rubber ducks placed in the bathtub. There’s even a traditional African storytime kids can take part in down in the Library. 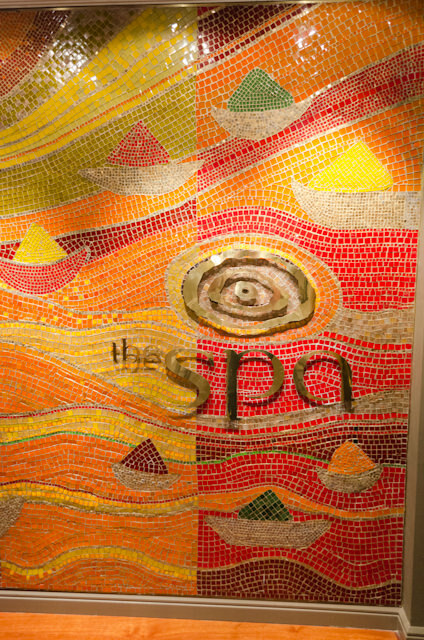 Like any good hotel, the Cape Grace has a spa on-site. But unlike any good hotel, this one has locally-inspired treatments, including one that features sand from the Namib Desert. I ran my fingers through some of the sand: it feels soft and inviting, with a texture similar to that of cocoa powder. 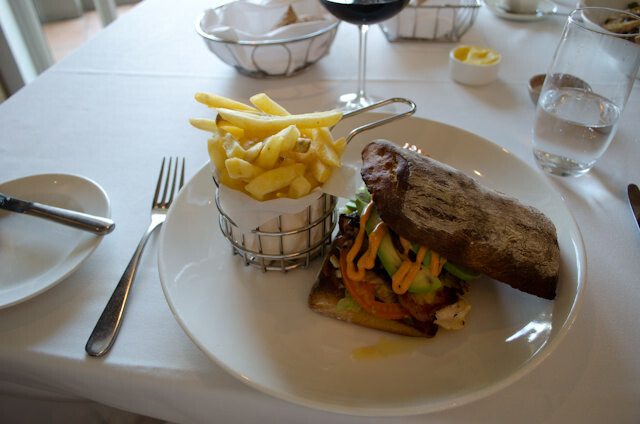 The spa is, of course, enhanced with breathtaking views of Table Mountain, and can even be transformed into a private dining venue for special occasions like proposals, with your own private waiter and a full menu of offerings. 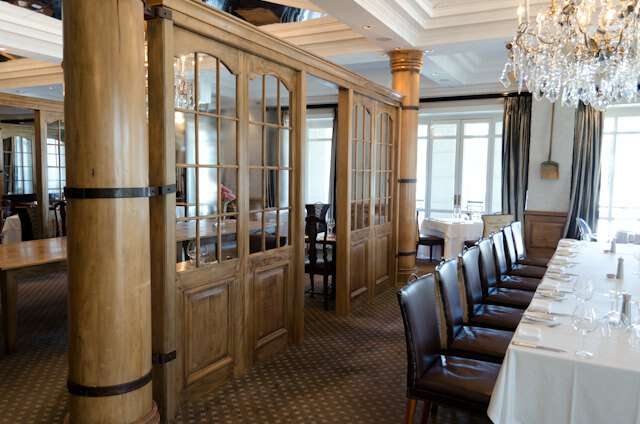 Speaking of food, the on-site restaurant, Signals, could have been lifted off of some of the greatest steamships of the 1800’s, with a beautiful space reminiscent of the lounge aboard the Great Eastern of 1858. The wine list at Signal was massive and very reasonably priced, and even my Club Sandwich – which should be pretty “Plain Jane” came out with its own unique twist, served up on fresh bread and heaped with loads of avocado. As I left South Africa, I am surprised at what an impact this one property had on me. 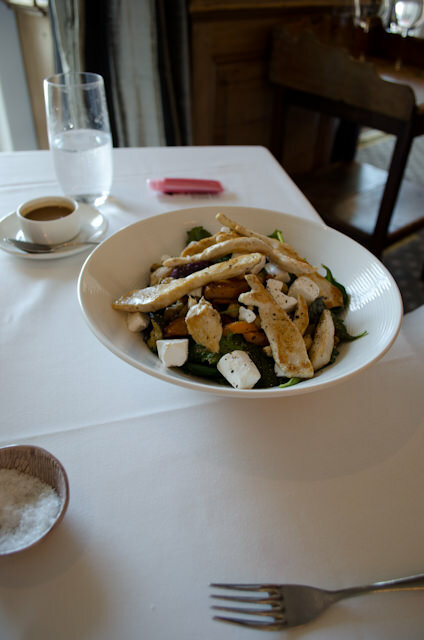 I’ve toured and stayed at beautiful hotels around the world, yet few have had the kind of emotional impact the Cape Grace hotel did. I remain very conscious that, as I return to Vancouver, it isn’t just the weather that will seem dull and grey. 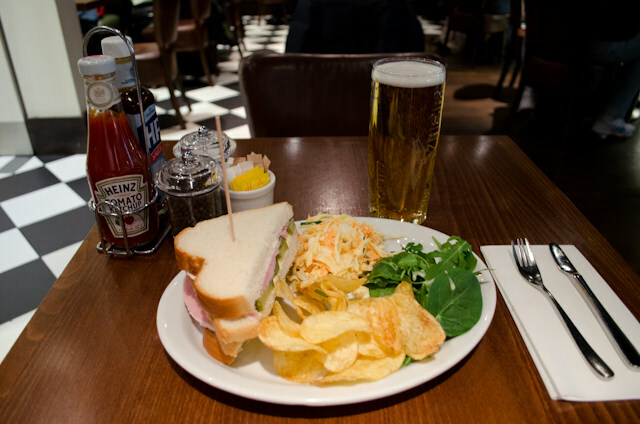 People normally stay at hotels because they’re visiting a country. 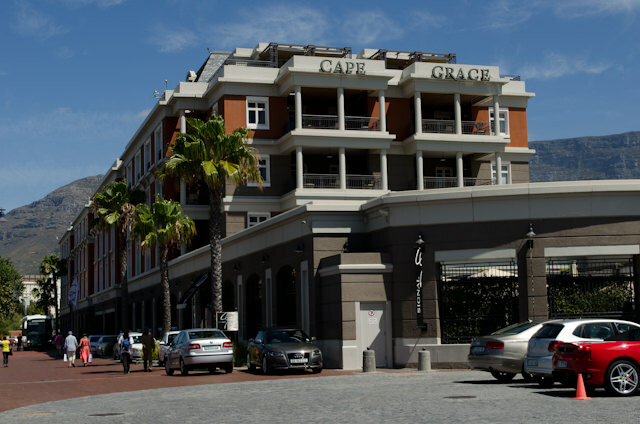 I will return to South Africa to stay at the Cape Grace. On the eve of my departure from Cape Town, I ran into some new friends from the UK who had sailed with me on the Silver Wind. They were waiting for a Virgin Atlantic flight to Heathrow, while I was headed there on British Airways. Vince, a Scot with a great sense of humour, says that he liked my blog, but he had thought the guides were saying the elephants were “in musk” when they were ready to mate. I thought they were saying they were “in mast.” So we had this lively debate in the middle of the café near the departures terminal about which one it was. A quick Wikipedia search revealed we were both wrong: an elephant is in musth, which is actually pronounced mast. You just never know what you’ll learn when you travel. The past two weeks have been a whirlwind of activity, the likes of which I’ve never seen or experienced before. 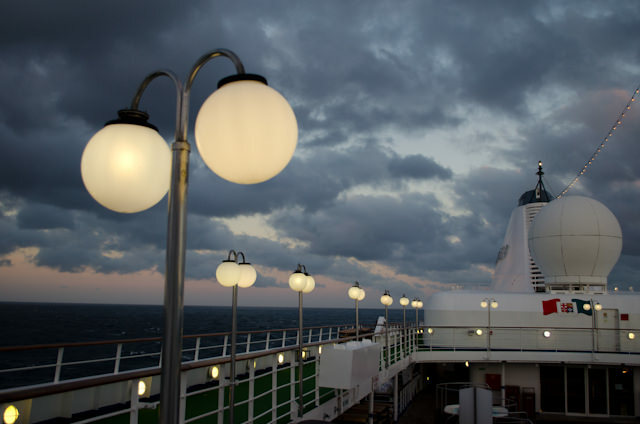 For me, my 10 days spent aboard Silver Wind equals the 11 days I spent sailing aboard Silversea’s expedition vessel, the Silver Explorer, around Britain, Ireland and Scotland last May – a voyage I never expected to be able to match in terms of its raw, unchained power. 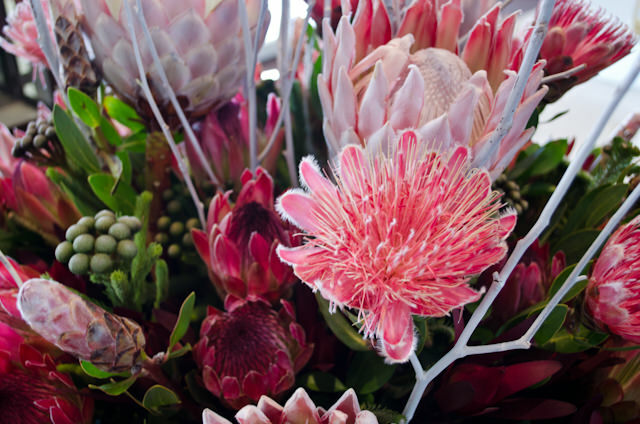 For North Americans, the journey to South Africa is long – but the rewards are many. 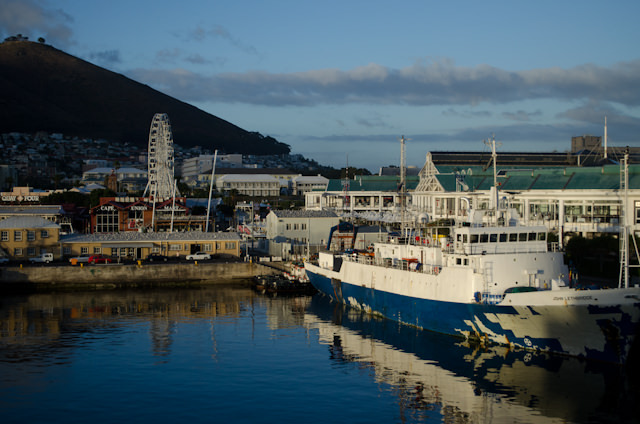 The things I saw and did aboard Silversea’s Silver Wind changed my life, and the people of South Africa will long remain in my memories. 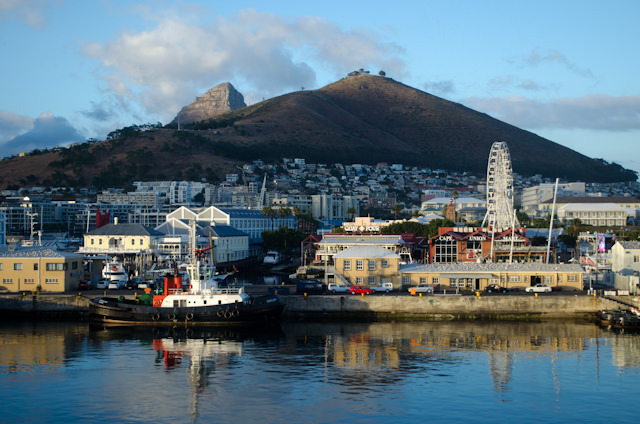 When I first came to Cape Town, I heard that as many as 80 percent of visitors to South Africa return.